If you have a business and would like a toll free number, United World Telecom can help. 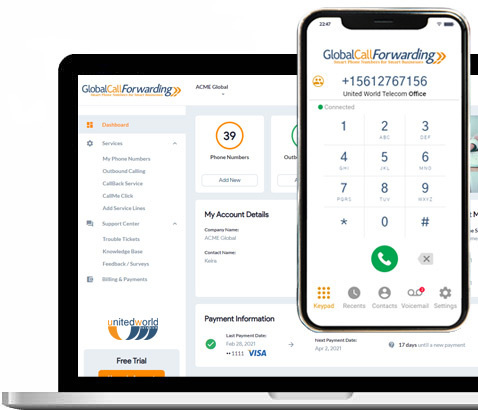 We have an extensive inventory of toll free numbers in countries across the world that can be routed to almost any phone or VoIP/SIP line across the globe. A toll free number is a telephone number with a distinct three digit code that can be called from landlines without charge to the person placing the call. These numbers are common for customer service departments and hotlines for businesses all over the world. These numbers give customers an easy and free way to contact businesses. Wireless callers are charged for airtime minutes used during the call unless their calling plan is “unlimited” with their wireless carrier. The number format for United States toll free numbers is 1-8XX-123-4567, where 8XX can be 800, 888, 877, 866, 855, 844, or 833. Callers can dial the 8XX numbers from landlines, mobile phones, payphones, and fax transmissions, but not from other countries. In Australia, toll free phone numbers use a “1800,” “1300”, or “13” prefix followed by four to 10 digits. United World Telecom’s “1800” toll free numbers allow calls from landlines, mobile phones, payphones, and fax transmissions. However, local providers may charge connection fees or place additional restrictions on mobile phone calls. Numbers with “13” or “1300” prefixes are “Local Rate Numbers”, and companies in different regions can use them. Providers charge connection fees for calls to “13” numbers. In Denmark, toll free phone numbers use an “80” prefix followed by six digits. United World Telecom offers two types of toll free numbers: toll free and toll free (mobile accessible). The less expensive, toll free type only accepts calls from landlines and fax transmissions while the toll free (mobile accessible) type accepts calls from landlines, mobile phones, pay phones, and fax transmissions. Hungarian toll free numbers use an “80” prefix. United World Telecom offers mobile accessible toll free phone numbers that accept calls from landlines, mobile phones, pay phones, and fax transmissions. United World Telecom offers toll free (mobile accessible) numbers with “1801” prefixes followed by six digits. Israel also has “1700” local rate numbers. The first three to four minutes are free to the caller after which both parties share the cost of the call. Italian toll free numbers use an “800” or “803” prefix. United World Telecom offers toll free phone numbers and toll free (mobile accessible) types. The toll free type is less expensive and accepts calls from landlines and fax transmissions. The toll free (mobile accessible) type accepts calls from landlines, mobile phones, and fax transmissions. In Japan, the official prefixes for toll free numbers are “0120” and “0800.” Several telephone carriers offer toll free numbers services with an “0077” prefix. United World Telecom offers a lower cost, toll free type that is accessible from landlines and fax transmissions. Their toll free (mobile accessible) option is accessible from landlines, mobile phones, fax transmissions, and other countries. The South Korean toll free prefix is “080.” United World Telecom offers toll free and toll free (mobile accessible) numbers. The toll free type, which is slightly costlier for low minute usage, is accessible to landlines, pay phones, and fax transmissions. The toll free (mobile accessible) type is available to mobile phones. The Malaysian toll free number format is “1800” followed by six digits. United World Telecom offers toll free (mobile accessible) numbers. Callers can call using landlines, mobile phones, pay phones, and fax transmissions. However, some local providers may prohibit toll free use of the numbers. The Nepalese toll free phone numbers begin with “1660-01” followed by five digits. In New Zealand, toll free numbers use “0800” and “0508” prefixes. United World Telecom offers toll free and toll free (mobile accessible) numbers. Callers can dial the toll free type from landlines and fax transmissions. They can dial the more expensive toll free (mobile accessible) type numbers from landlines, fax transmissions, and mobile phones. The Russian toll free number prefix is “8-800” followed by seven digits. United World Telecom offers toll free (mobile accessible) numbers. Callers can dial from landlines, mobile phones, pay phones, and fax transmissions. In Spain, toll free phone numbers have two formats: “900” or “800” plus 6 digits. United World Telecom has less expensive, toll free numbers that are available to landlines and fax transmissions. The toll free (mobile accessible) numbers are accessible to landlines, mobile phones, pay phones, and fax transmissions. Swedish toll free formats are “020” or “0200”. United World Telecom offers toll free and toll free (mobile accessible) numbers. Callers can dial the less expensive, toll free numbers from landlines and fax transmissions. The toll free (mobile accessible) numbers are available to landlines, mobile phones, pay phones, and fax transmissions. In Taiwan, the toll free prefix is “0801” followed by six digits. United World Telecom offers toll free (mobile accessible) numbers. Callers can dial from landlines, mobile phones, pay phones, and fax transmissions.